Photo by JL1967 from the Torontoist Flickr Pool. When many Torontonians think of poverty, the first issues that come to mind are housing and food. Mobility is often overlooked, creating a gap in accessibility and services available to those looking to get around the city. Grassroots organization TTCriders has established the Fair Fare Coalition in an attempt to fill that gap. Last month, members attended City Hall to push for lower TTC prices for the city’s lowest income residents. The group is lobbying to create a program that allows low-income Torontonians access to a $50 Metropass and $1 single-ride tokens to get on trains, buses, and streetcars. Meinzer says TTCriders arrived at these figures when they realized many people living with social assistance end up working low-paying jobs, or end up in positions where they’re working part time, meaning any price based on a percentage of income isn’t the best option on such fine margins. TTCriders also created a petition outlining their terms to Mayor John Tory, Premier Kathleen Wynne, other members of Council, and the TTC chair. At the time of publication, the petition had 412 signatures. The TTC currently offers discounted Metropasses, but only to customers, typically larger companies, who buy the passes in bulk. Discounts off of the $141.50 adult Metropass are between 10 and 12 per cent, depending on the volume of passes purchased. The Fair Fare Coalition published a report [PDF] that recommends Torontonians receiving benefits from the Ontario Works program and Ontario Disability Support Program receive a free Metropass. The report reasons that those receiving benefits from both programs shouldn’t be spending money on public transport, and that they should be spending their basic needs allowance solely on basic needs such as food and shelter. Similarly, the report suggests that workers below the low income cut-off who do not receive benefits should qualify for $50 Metropasses and $1 tokens. Those prices mean a worker in a family of two (parent or grandparent and child or grandchild) would spend roughly three per cent of their income of about $23,000 or less on transit. The report also recommends that low-income passes and tokens be treated identically to their full price counterparts, that service for discount customers not be limited to off-peak hours or certain days of the week. In their research, the Fair Fare Coalition found those in need of low-income passes may be living where there is adequate transit, but have long commutes which can require the use of two transit systems and multiple fare payments per trip. Meinzer, who is also a literacy instructor at an adult learning centre, has seen this firsthand. Expensive, long-distance commutes could become an even bigger issue for low-income Torontonians if Metrolinx chooses to instate zoned fares in the city. This would travel for longer distances—particularly from the GTA to the downtown core—more expensive than that within the city. Last week, Mayor Tory voiced his support for zoned fares. 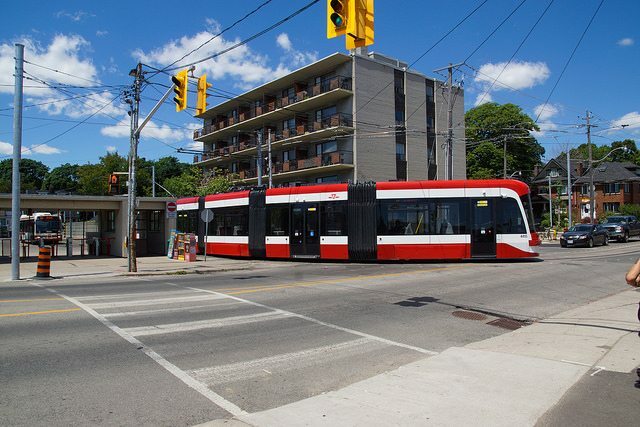 Meinzer said that beyond helping Torontonians who need a low-cost mobility option, subsidized access to the TTC shouldn’t have to be justified by potential increases in revenue and ridership. Sean Hertel, the co-author of the 2015 GTA and Hamilton transit study “Switching Tracks,” echoes Meinzer’s sentiments. Hertel’s study determined that transit is a “broader public good and social issue,” meaning senior government needs to step in to help with subsidization. Hertel said the economic factors are outweighed by the need for transit equity, especially in areas that are underserved by available transit options. In addition to paying less, it’s about giving people more dignity as well. “We need to get a better grasp on who the ‘public’ in ‘public transit’ really is,” Hertel says.